New photo, same delicious recipe! I love beets but my family doesn't. I continually look for new ways to present beets so that everyone will discover how good they are. One of my favorite ways to eat beets is this soup. The family will eat it, especially if I puree it, but they don't love it like I do. That's why I was delighted to get this recipe from a friend. She got it from her CSA farmer! The inspiring recipe was for crostini, but I use it on crackers, on bread in a sandwich--good with radishes, cucumbers, sliced cheese and lettuce, and as a dip for sliced veggies. This keeps for at least a week in the fridge. For other recipes featuring beets, please see my Beet Recipes Collection, part of my Visual Recipe Index. Preheat the oven to 400 degrees. 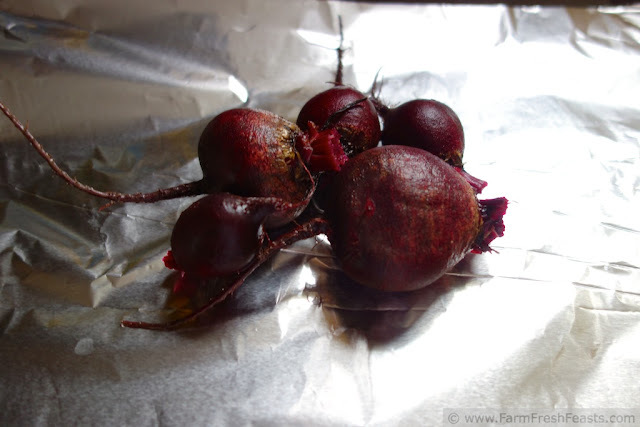 Place the beets on a sheet of foil. Drizzle oil over top, and fold up into a packet. Roast for 45 minutes to 1 hour until the packet is soft when you squeeze it. Once the packet is cool enough to handle, slip the beet skins off (compost the skins!). Your fingertips will turn pink. 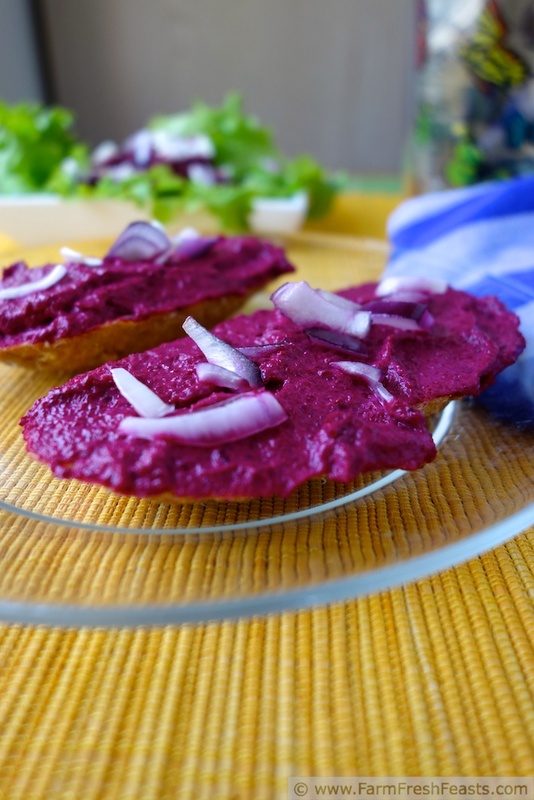 It's ok. Place the beets in the bowl of a food processor. Add the goat cheese Process until you get a uniformly bright magenta spread (alternatively, mash with a potato masher or fork). Add 1/4 teaspoon of freshly ground pepper to start, and a pinch of salt. Pulse a few times to incorporate the seasonings, taste, and add more salt and pepper if you like. This post is linked up with Food on Fridays twice. I can totally relate - I think beets are great, but my husband? not so much. =) There's a recipe on my blog for a spiced chocolate cake with truffle ganache that I snuck a whooole bunch of beets into + fed to my husband + in-laws one night - that's the only beet recipe I've been able to pass off on them so far! =) I've gotta try this spread - sounds delicious! Right now I'm the only beet lover in the house, though the kids will eat them in a blueberry smoothie, even if I tell them. Oooh-I'll be getting beets in the Fall share, so I'll come check out your cake recipe. My cousin puts beets in spaghetti sauce, to pump up the color. I may try that too. I'm so happy you're hosting a different food focus each Friday! 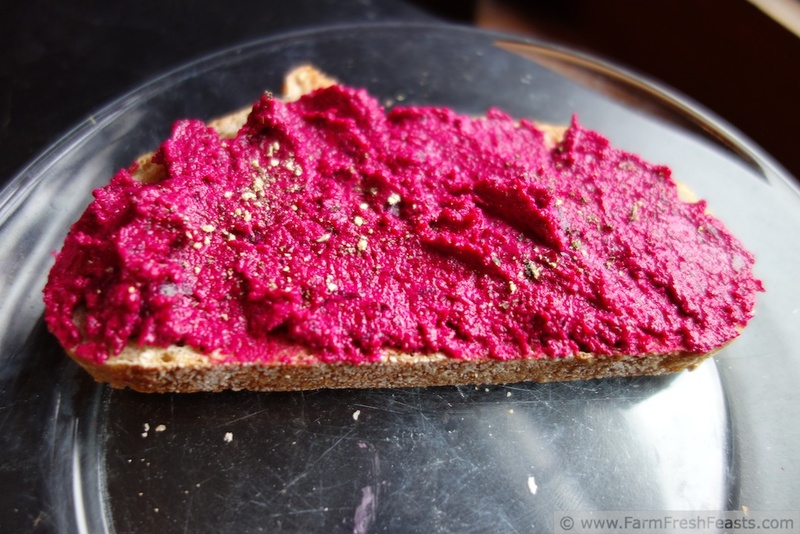 I made this but just chopped the beets finely and then mixed in with a package of that boursin cream cheese with cracked pepper! Added some finely grated Asiago cheese and a little chopped red onion.... mmmm! It was delicious on crackers as an easy appetizer. Thanks for the ideas!